We can pump blown-in mineral wool insulation into the attic. This is a very popular option (especially in low pitched roof’s). Some of the benefits of this option include reduced thermal loss because the insulation coverage is 100% – You will not have any gaps between insulation rolls. We can install Knauf ECOSY ‘Earthwool’ rolls. These are rolled across the top of existing timber joists (perpendicular to existing insulation). The ‘Earthwool’ is new-generation insulation that does not have the ill-affects of traditional fibreglass insulation. When we insulate an attic space we also provide an option for storage area. We can supply and fit a raised timber storage area. This consists of rasied 6 * 2 inch joists with a 20mm OSB Sheeting on top. This solution is fully accepted by SEAI for the current Home Energy Savings Grant Scheme. 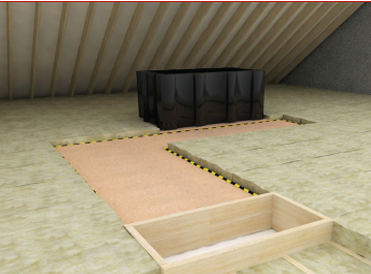 The image above shows an insulated attic consisting of insulated walkway from attic hatch to water tank. Walkway and handrail from attic hatch to water storage tanks. Insulation of water tank and associated pipework. We Insulate and draft-seal the attic hatch. We can remove existing stored items from the attic if required. Call or email Connolly Insulation today for a free no obligation consultation. Grants are available on the SEAI 'Better Energy' Scheme: Cavity wall grant €400, attic insulation grant €400.